Daniel Jalkut has updated FastScripts, my utility of choice for running scripts or opening favorite files with a keystroke or a trip to the menu bar. 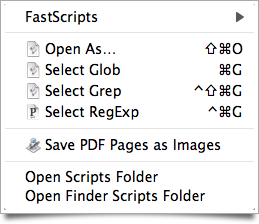 My FastScripts menu, as it appears in the Finder. Notably, there is now just one version of FastScripts, which may be used for free or upgraded to allow more than ten keyboard shortcuts. Posted on Monday, June 22nd, 2009. Tags: applescript, fastscripts, mac.